Over the coming months I will be posting a series of 'ThingLink' resources on texts that are on the Leaving and Junior Certificate English courses. ThingLink is a fantastic web based, also on iPad, program that allows the creator to attach online documents, pictures, sounds, links or videos to an image or collection of images. In the first in the series I have put together some images on Henrik Ibsen's A Doll's House. I used Wikimedia Commons to find the images, then Pic Collage to piece them together before finally adding the content with ThingLink. 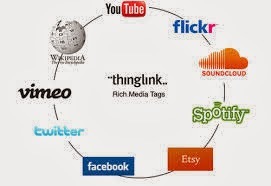 If you create a ThingLink account I will create the resources in such a way, that anybody can add to or edit them. I hope to, for example, upload my own notes/activities to SkyDrive and then attach them to the ThingLink resource. Try and guess why the images are relevant to the text in class/at home before clicking on the content!